The myofascial pain syndrome is a common clinical problem of muscle pain involving sensory, motor and autonomic symptoms caused by myofascial trigger points. Despite myofascial pain is a commonly found in clinical practice, there are few prevalence studies found in the scientific literature. Skootsky et al. found that 30% of patients that visited a primary care unit presented myofascial trigger points. In a recent study regarding shoulder pain Bron et al. concluded that all 72 subjects included in their study presented myofascial trigger points in shoulder girdle muscles, mainly in the infraspinatus muscle and upper trapezius. A myofascial trigger point is defined as a hyperirritable spot, usually within a taut band of skeletal muscle wich is painful on compression and can give rise to characteristic Referred Pain, motor dysfunction and autonomic phenomena. Pain on compression. This may elicit local pain and/or referred pain that is similar to a patient's usual clinical complaint or may aggravate the existing pain. Local twitch response. 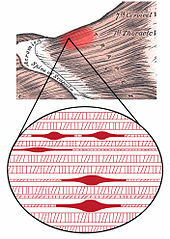 Snapping palpation (compression across the muscle fibers rapidly) may elicit a local twitch response, which is a quick contraction of the muscle fibers in or around the taut band. Muscle tightness. Restricted range of stretch, and increased sensitivity to stretch, of muscle fibers in a taut band may cause tightness of the involved muscle. Local myasthenia. The muscle with a trigger point may be weak, but usually no atrophy can be noticed. Patients with trigger points may have associated localized autonomic phenomena, including vasoconstriction, pilomotor response and hypersecretion. When the pain resulting from an active trigger point becomes persistent the patient may develop satellite trigger points. 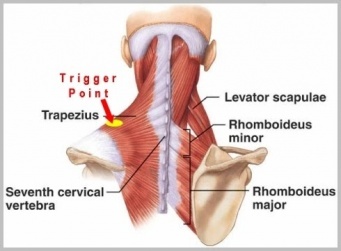 A satellite trigger point is localized in the referral zone of the primary trigger point (i.e. the active trigger point that was originally activated), usually in an overloaded synergist muscle. This referral zone corresponds to the pain pattern described by the patient, it is often described as a diffuse pain, usually distant to the active trigger point location. This is explained by the effects of Central sensitization and each trigger point has its own referral zone. Another interesting clinical characteristic is the spontaneous electrical activity (SEA) recorded in myofascial trigger point sites with needle electromyography. The site of this electrical activity is called "active locus". SEA consists of continuous, noise-like action potentials that can range from 5 to 50 µV, with intermittent large amplitude spikes up to 600 µV. This abnormal endplate potential is caused by an excessive release of acetylcholine at the motor endplate. The magnitude of SEA is related to the pain intensity in patients with myofascial trigger points. In clinical practice, there is no benefit in using needle electromyography and its utility is limited to research studies. Several possible mechanisms can lead to the development of myofascial trigger points, including low-level muscle contractions, muscle contractures, direct trauma, muscle overload, postural stress, unaccustomed eccentric contractions, eccentric contractions in unconditioned muscle, and maximal or submaximal concentric contractions. Low-level muscle contractions involve a selective overload of the earliest recruited and last derecruited motor units ("Henneman's size principle"). Smaller motor units are recruited before and derecruited after larger ones; as a result, the smaller type I fibers are continuously activated during prolonged motor tasks, which in turn it can result in metabolically overloaded motor units with a subsequent activation of autogenic destructive processes and muscle pain, this is also known as the Cinderella hypothesis. Direct trauma may create a vicious cycle of events wherein damage to the sarcoplasmic reticulum or the muscle cell membrane may lead to an increase of the calcium concentration, a subsequent activation of actin and myosin, a relative shortage of adenosine triphosphate (ATP), and an impaired calcium pump, which in turn will increase the intracellular calcium concentration even more, completing the cycle. As a result taut bands inside muscle may be developed and lead to the formation of active or latent myofascial trigger points. The initial change in muscle that is associated with myofascial pain seems to be the development of the taut band, which is in term a motor abnormality. Several mechanisms have been hypothesied to explain this motor abnormality, the most accepted one is the "Integrated Hypothesis" first developed by Simmons and later expanded by Gerwin. Simmons' integrated hypothesis is a six-link chain that starts with the abnormal release of acetylcholine. This triggers an increase in muscle fiber tension (formation of taut band). The taut band is thought to constrict blood flow that leads to local hypoxia. The reduced oxygen disrupts mitochondrial energy metabolism reducing ATP and leads to tissue distress and the release of sensitizing substances. These sensitizing substances lead to pain by activation of nociceptors and also lead to autonomic modulation that then potentiates the first step: abnormal acetylcholine release. Gerwin expanded this hypothesis by adding more specific details. 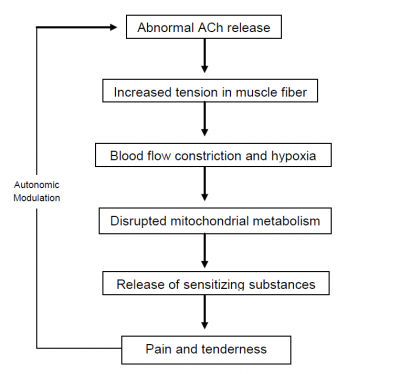 He stated that sympathetic nervous system activity augments acetylcholine release and that local hypoperfusion caused by the muscle contraction (taut band) resulted in muscle ischemia or hypoxia leading to an acidification of the pH. The prolonged ischemia also leads to muscle injury resulting in the release of potassium, bradykinins, cytokines, ATP, and substance P which might stimulate nociceptors in the muscle. The end result is the tenderness and pain observed in myofascial trigger points. Depolarization of nociceptive neurons causes the release of calcitonin gene-related peptide (CGRP). CGRP inhibits acetylcholine esterase, increases the sensitivity of acetylcholine receptors and release of acetylcholine resulting in SEA. In recent studies Shah et al. confirmed the presence of these substances using microdyalisis techniques at trigger point sites. Elevations of substance P, protons (H+), CGRP, bradykinin, serotonin, norepinephrine, TNF, interleukines, and cytokines were found in active trigger points compared to normal muscle or even latent trigger points. The pH of the active trigger point region was decreased as low as pH 4 (normal pH value is 7,4) causing muscle pain and tenderness as well as a decrease in acetylcholine esterase activity resulting in sustained muscle contractions. In some cases there may be perpetuating factors that have a feed forward effect on myofascial pain. These factors may chronify the pain and tenderness. Perpetuating factors may also have an important role in wide spreading the referred pain by Central sensitization mechanisms. In some cases, managing and correcting an identified perpetuating factor may lead to a complete resolution of pain and may be the sole therapeutic approach needed to relief the patient’s symptoms. Palpation is the gold standard in identifying the presence of taut bands in muscle. This involves the training and accurate skills of practitioners to identify these taut bands. Palpation of taut bands needs a precise knowledge of muscle anatomy, direction of specific muscle fibres and muscle function. The palpation on muscle must meet several essential criteria and confirmatory observations to identify the presence of trigger points. The interrater reliability of palpation has been a subject of scientific research over the past years. There has been improvement in the methodological quality in recent studies but the main problem rests the lack of rater blinding. It is a problem hard to solve because the reliability of palpation depends on a high expertise level from the examiner. Recent research has shown interesting results using magnetic resonance elastography. The technique involves the introduction of cyclic waves into the muscle, and then using phase contrast imaging to identify tissue distortions. The speed of the waves is determined from the images. Shear waves travel more rapidly in stiffer tissues. The taut band can then be distinguished from the surrounding normal muscle. Another recent technique used to confirm the extension of myofascial trigger point sites is sonoelastography combined with Doppler imaging. It uses a clinical ultrasound imaging system with a 12-5 MHz linear array, associated to an external vibration source (hand held vibrating massager) working at cycles of approximately 92Hz. Doppler imaging is used to identify surrounding blood flows. Ballyns et al. showed in their study that sonoelastography can be a useful tool to classify myofascial trigger points by area. Larger areas correspond to active trigger points and smaller ones to latent trigger points. To note that this technique needs preliminary manual palpation of trigger points. One source of confusion associated with myofascial pain is fibromyalgia. It is true that both entities are likely to cause severe muscle pain and tenderness but they do not share the same etiology or pathogenesis and their clinical presentation is not the same. Therefore two different conditions should be distinguished. In 1990 the American College of Rheumatology published the diagnostic and classification criteria for fibromyalgia. This classification has been updated recently in 2010. The diagnosis of fibromyalgia is based on a history of widespread pain (for at least 3 months of duration), defined as bilateral, upper and lower body, as well as spine, and the presence of excessive tenderness on applying pressure to 11 of 18 specific muscle-tendon sites or tender points. A differential diagnosis should be made with other conditions such as: muscle spasm, neuropathic or radicular pain, delayed onset muscle pain, articular dysfunction and infectious myositis. In a recent study, Bron et al. conducted a controlled trial in the treatment of myofascial trigger points in patients with shoulder pain. They decided to only use manual techniques associated with home exercises and ergonomic recommendations. After 12 weeks of treatment there was a statistically significant improvement in the intervention group compared with the control group. On the other hand there are different invasive techniques that share a common goal: the inactivation of an active loci in a central trigger point with a needle. ↑ Skootsky, S. A., Jaeger, B. Oye, R. K. (1989). Prevalence of myofascial pain in general internal medicine practice. Western Journal of Medicine, 151(2), 157. ↑ Bron, C., Dommerholt, J., Stegenga, B., Wensing, M., Oostendorp, R. A. (2011). High prevalence of shoulder girdle muscles with myofascial trigger points in patients with shoulder pain. BMC musculoskeletal disorders, 12(1), 139. ↑ 4.0 4.1 4.2 Fernández‐de‐las‐Peñas, C., Cuadrado, M. L., Arendt‐Nielsen, L., Simons, D. G., Pareja, J. A. (2007). Myofascial trigger points and sensitization: an updated pain model for tension‐type headache. Cephalalgia, 27(5), 383-393. ↑ Hubbard, D. R., Berkoff, G. M. (1993). Myofascial trigger points show spontaneous needle EMG activity. Spine, 18(13), 1803-1807. ↑ 6.0 6.1 Gerwin, R. D. (2001). Classification, epidemiology, and natural history of myofascial pain syndrome. Current pain and headache reports, 5(5), 412-420. ↑ Bron, C., Dommerholt, J. D. (2012). Etiology of myofascial trigger points. Current pain and headache reports, 16(5), 439-444. ↑ Enoka, R. M. Stuart, D. G. (1984). Henneman's ‘size principle’: current issues. Trends in neurosciences, 7(7), 226-228. ↑ Thorn, S., Forsman, M., Zhang, Q. Taoda, K. (2002). Low-threshold motor unit activity during a 1-h static contraction in the trapezius muscle. International Journal of Industrial Ergonomics, 30(4), 225-236. ↑ Kallenberg, L. A., Hermens, H. J. (2006). Motor unit action potential rate and motor unit action potential shape properties in subjects with work-related chronic pain. European journal of applied physiology, 96(2), 203-208. ↑ 11.0 11.1 Gerwin, R. D., Dommerholt, J., Shah, J. P. (2004). An expansion of Simons’ integrated hypothesis of trigger point formation. Current pain and headache reports, 8(6), 468-475. ↑ Shah, J. P., Danoff, J. V., Desai, M. J., Parikh, S., Nakamura, L. Y., Phillips, T. M., Gerber, L. H. (2008). Biochemicals associated with pain and inflammation are elevated in sites near to and remote from active myofascial trigger points. Archives of physical medicine and rehabilitation, 89(1), 16-23. ↑ Mense, S., &amp Gerwin, R. D. (Eds.). (2010). Muscle pain: diagnosis and treatment. Springer Science Business Media. ↑ Bron, C., Franssen, J., Wensing, M., Oostendorp, R. A. (2007). Interrater reliability of palpation of myofascial trigger points in three shoulder muscles. Journal of Manual Manipulative Therapy, 15(4), 203-215. ↑ Gerwin, R. D., Shannon, S., Hong, C. Z., Hubbard, D., Gevirtz, R. (1997). Interrater reliability in myofascial trigger point examination. Pain, 69(1), 65-73. ↑ Lucas, N., Macaskill, P., Irwig, L., Moran, R., Bogduk, N. (2009). Reliability of physical examination for diagnosis of myofascial trigger points: a systematic review of the literature. The Clinical journal of pain, 25(1), 80-89. ↑ Chen, Q., Bensamoun, S., Basford, J. R., Thompson, J. M., An, K. N. (2007). Identification and quantification of myofascial taut bands with magnetic resonance elastography. Archives of physical medicine and rehabilitation, 88(12), 1658-1661. ↑ Ballyns JJ, Shah JP, Hammond J, Gebreab T, Gerber LH, Sikdar S. Objective Sonographic Measures for Characterizing Myofascial Trigger Points Associated With Cervical Pain. Journal of ultrasound in medicine : official journal of the American Institute of Ultrasound in Medicine 2011;30(10):1331-1340. ↑ Alila Medical Media. Myofascial Pain Syndrome and Trigger Points Treatments, Animation.